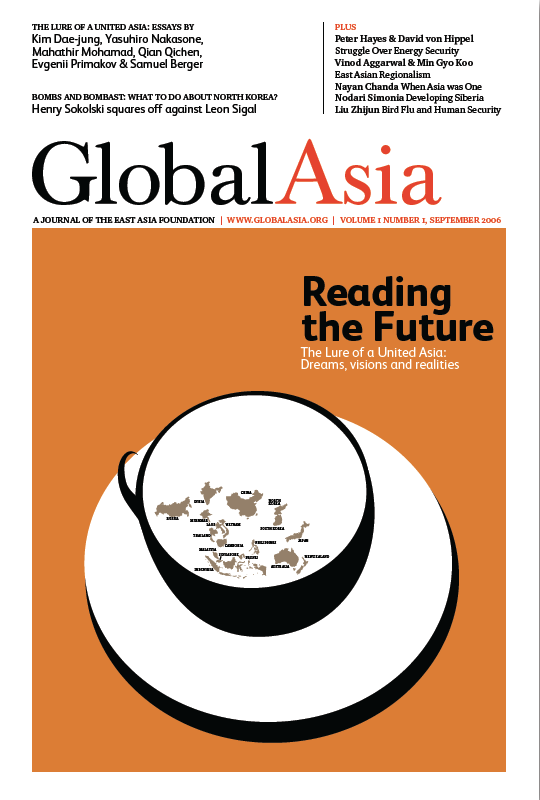 Welcome to the first issue of Global Asia, a journal of the East Asia Foundation. The Foundation, established in Seoul in January 2005, strives to promote peace, prosperity, security and sustainability in East Asia by creating an open and creative forum for the exchange of ideas on regional cooperation and integration, among other goals. The mission we have set for ourselves with Global Asia is both bold and urgent: It is to provide a compelling, serious, and responsible forum for distinguished thinkers, policymakers, political leaders and business people to debate the most important issues in Asia today. Global Asia is not a journal with a fixed point of view, or a particular agenda. Our aim is to give voice to the global dimension of what is happening in Asia. In our pages, Asia will speak to the world, and the world to Asia. That is important at a time when this region is playing an ever greater role in world affairs. There are other fine publications on international affairs. What sets us apart is our focus: Asia. We believe, in fact, that the world is entering “the Age of Asia,” to borrow a phrase from one of the articles in this issue of Global Asia. This transformation is not going to occur overnight, but it has already begun. The region’s dynamic economic growth, stable and accountable political systems, maturing democracies, and evolving sense of community are giving Asia greater weight in the world. These developments will have enormous implications for governments, businesses, societies and individuals across the globe. How that transformation is viewed, and shaped, from within Asia and how it is perceived outside Asia is an essential part of the story we have to tell. The forces of globalization are having a profound impact throughout the world. And they are being influenced and channeled in different ways in different parts of the world. Ours is the story of Asia’s experience with globalization, and the ideas and debates that are influencing it. In pursuing our mission in these pages in the months and years ahead, we hope to play however small a part in helping to shape the future of Asia. 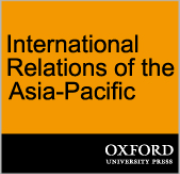 In this inaugural issue, we feature a package of articles on the future of East Asian regionalism. We are grateful that our efforts were supported by articles from a number of distinguished former political leaders: President Kim Dae-jung of the Republic of Korea; Prime Minister Mahathir Mohamad of Malaysia; Prime Minister Yasuhiro Nakasone of Japan; Vice Premier Qian Qichen of China; Prime Minister Evgenii Primakov of Russia; and National Security Advisor Samuel R. Berger of the U.S. This issue of Global Asia will be followed by a second issue in March 2007. 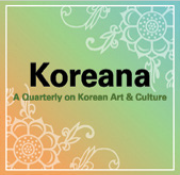 We plan to begin publishing quarterly by 2008. Again, welcome to Global Asia. Let us know what you think. Six voices, six views, one Asia. Global Asia asked a distinguished group of political leaders and policymakers to tell us how they see the future of Asia and the prospects for greater. The 21st Century is an age where globalization and regionalism both coexist and compete with each other. Though the tide of globalization is strong, there is also a countervailing need for regionalism, argues Kim Dae-jung. When Malaysia suggested the formation of an East Asia Economic Group (EAEG) in 1991, the US rallied its allies to reject the idea. The reason was little short of racism, because the grouping would not be ethnic European. But the idea has merit. Having adopted the common goal, or ideal, of creating a future community, the 13 nations of Northeast and Southeast Asia must now provide their citizens with a roadmap toward that future and indicate what they should do. The long evolution of globalization has delivered great progress to our world. 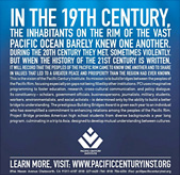 We ought to reflect on these historical lessons to prevent future misfortune. The Asia-Pacific's economic development and influence over world politics has transformed it into one of the most dynamic regions of the globe, but in recent years the rapid growth of India and China has meant that economic development is uneven. The United States has been a staunch supporter of the creation of regional institutions in the Asia-Pacific region for almost two decades, and of intro-Asian groupings since the formation of the Association of Southeast Asian Nations three decades ago. Shifting Ground: Is it Finally Time? A decade ago, policymakers and analysts argued that East Asian countries were incapable of managing their own economic and security affairs. Things are changing. It's time to make clear to North Korea that matters will get worse, not better, if it doesn't reconsider its current nuclear course. Avoiding this approach risks tempting other countries to follow Pyongyang's example. For years, both in Soviet and post-Soviet times, Russian East Siberia and the Far Eastern regions were treated as an unloved stepchild. Lately, however, the winds of change have been felt. As bird flu spreads, fears of a human pandemic deepen. Fortunately, the international community is trying to cope with the specter of a bird flu pandemic through a number of cooperative measures worldwide. Strong economic growth in Northeast Asia, especially in China, will vastly expand demand for both energy services and fuel in coming decades. The rise of Asia portends much for the world, and not just for the prevailing economic order.